Wealth and prosperity usually results in lavish and unnecessary spending by regimes. But it is not the case with governments with broad vision that wants to provide continuous comforts to its citizens and keep the economic situation running in a smooth way even in the presence of financial crisis. This type of behavior has been proved by the government of UAE. The leadership of the country has always tried to manage its expenses wisely in order to maintain the economic condition of the country in every thick and thin. A recent study has proved that the approach of the rulers of UAE is best not only in the region but also in the whole world. The World Economic Forum has just published its Global Competitive Index for 2017-2018 where 136 countries were ranked according to the efficiency of government spending. The index placed UAE at the top of the list in the whole Middle East & North Africa (MENA) region. 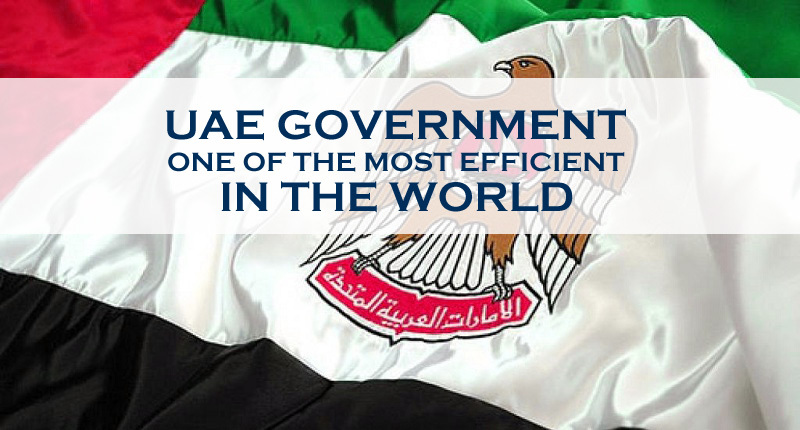 In fact, it is neither the first time nor the only international institute that placed the government of UAE to be one of the most efficient in the world. In 2014, Swiss-based IMD (International Institute for Management Development) also ranked UAE on top of world for most efficient government. It shows that the leadership of UAE is striving hard to stabilize the economic condition of the country since the oil crisis in 2014 and the efforts are underway till now. Other international indicators are also showing favorable situation in the Gulf state. The IMF told that the fiscal deficit of UAE remained less than 5% of GDP in 2016. Introduction of VAT and liberalizing energy prices were important factors that kept the reduction of its fiscal deficit. All these reports are clear indicators of the seriousness and wisdom of the UAE governments with the steps it is taking for the growth of the economy and betterment of the prosperity of its people (residents and citizens). Previously, it was also announced that most of the revenue extracted through VAT will be provided to local governments that will ultimately be utilized for improving the lifestyle of the residents of the country. In the presence of such types of friendly regime, one can surely expect the economic stability in the country which is a necessity for growth of any business. This also provides an insight of the economic condition expected in the future that is attractive for entrepreneurs from around the world to choose UAE as their business jurisdiction. You can easily establish your business in UAE by contacting Riz & Mona Consultancy via our WhatsApp # 971-56-9971225. We will assist you in choosing right type of place according to your business and completing the whole visa and registration process.